Over three days and throughout three provinces, Canadians went to the polls to vote for mayor, city council, school trustee and several other municipal officials. In total there were over 1,400 individual races and thousands of candidates. 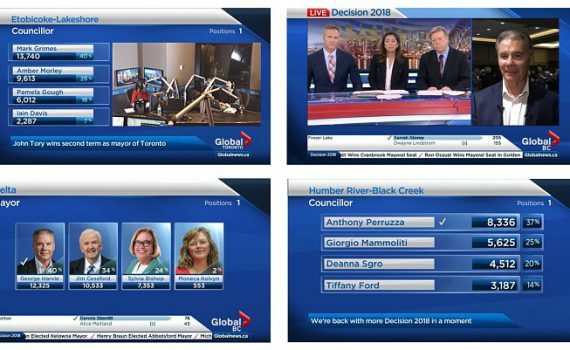 Bannister Lake’s Chameleon software and its election module tracked all of them delivering live results to Global Television stations and websites in British Columbia, Manitoba and Ontario. Multiple data feeds were used to bring in results data on October 20 from British Columbia, October 22 from Ontario and October 24 from Manitoba. Results data poured in not just from large metropolitan areas such as Toronto and Vancouver but also from smaller remote communities. “It’s the first time we’ve followed that many individual election races and such a high number of candidates. Chameleon handled it extremely well providing Global with real-time results. We were especially pleased we could ensure that results coming in from remote municipalities with slower data connections were fully optimized to be more efficient”, said George Hentsch, President, Bannister Lake. Live election data ingested into Chameleon allowed production staff to follow races, create playlists and make calls. Global also used Chameleon’s BLADE RESTful API to populate graphics on-set using augmented reality systems and to feed web objects that provided online users with race results. Bannister Lake provides broadcast editorial teams with the industry’s most versatile election results system. Chameleon software is managed via a web-based interface that allows an unlimited number of production and technical users access election results data. Teams can then integrate results into various election graphics templates, reformat data and redistribute it to other devices or production systems.